Remember this post? Well, probably not. Anyhow, in it I promised to try to eke revenge against the retailers of the world for the shabby way I was treated when I was a retail worker (1978 to 1980) for the now defunct Montgomery Ward Corporation which today is even worse. Now that I am retired, lack of time was no longer an excuse, so I made a note on my calendar to attend a Black Friday protest at my local Walmart (Sterling, Virginia in my case) to protest their appallingly low wages and working conditions. Signing up was easy. I was already a member of Making Change at Walmart, the site to go if you are not a Walmart employee but want to support their cause. I get regular emails from them and have even made a couple of contributions to their strike fund over the years. I was urged to find a Walmart Black Friday protest near me, so I simply filled in the web form and marked the date and time on my calendar. For several years now, the Our Walmart campaign has targeted Black Friday for protests because it is the busiest shopping day of the year. This year a record 1600 store protests was planned. Thus far my protesting had been confined to mass events on the national mall. This kind of protest would be a lot different. 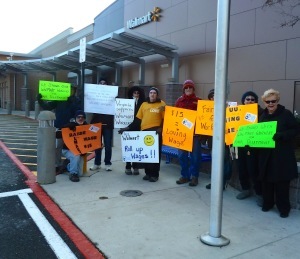 The number of protestors was likely to be small and Walmart would doubtlessly be on the lookout for us. Protest rules were pretty murky, but seemed worth whatever minor risk it entailed. This is after all Walmart: the nation’s largest, nastiest and stingiest employer. Every year they find new ways to screw their “associates”. Among their egregious tactics over the last year were requirements to buy their own uniforms, canceling health insurance for certain part time employees (doubtless few could afford it in any event), cutting the hours of workers (leading to predictably long lines at cash registers and empty shelves) and erratic schedules. All this for an average wage of $8.80 an hour and where you might get an extra dime per hour the next time your performance was reviewed. With several weeks of notice, I wanted to see if I could convince any others to join me. Notes on Facebook did not turn up any nibbles, so I sent a note to Paul, chair of the social justice committee at my local Unitarian Universalist Church. He agreed to sponsor the protest for our church. I made sure announcements were posted in the church bulletin and hoped a few members of my congregation would join me. We have less than 200 members, so I kept my expectations modest. Fortunately for me, it got the attention of certain influential women at the church (a.k.a. the Knitting Circle, which my wife attends) who were also suitably outraged and started making protest signs. On protest day, eight of us with signs in hand were ready to protest. However, our protest organizer weaseled out. Early on Black Friday morning we found an email from him in our inboxes. He claimed insomnia the night before and canceled the event, but he did encourage anyone that wanted to to come out and protest. We took him up on it. I confess it was hard to get in the protesting spirit when the temperature was in the low thirties with gusty winds, but we were ready. We met in the church parking lot, collected our signs and drove out to the Sterling Virginia Walmart. As we moved toward the entrance we encountered an older couple from Illinois in town but with signs. We were it, apparently, but at least with ten protestors we got into the double digits. For 10 AM on a Black Friday, there weren’t many people going into or out of this Walmart. We stood silently outside the Walmart entrances, being careful not to impede pedestrian or vehicular traffic. Occasionally we got a toot of a horn or thumbs up, but mostly we stood and shivered. We had a feeling though that it would not be long before Walmart management noticed us. We were prescient. After about ten minutes, a Walmart security officer told us we were on private property and we could only protest on public property. He pointed us to a hill at the far back end of the parking lot. Dutifully we walked back there. This was not an ideal location, but it was convenient to incoming traffic so we stood there with our signs and waved them up and down as cars went by. Apparently we were not far out enough. After fifteen minutes or so we found we were observed by officers in two cars from the Loudoun County sheriff’s office. Eventually an officer approached us with the Walmart store manager. We patiently explained we were directed here by their store security. But, no, we were still on private property we were told. Walmart owned all of it. Some sort of conglomerate of course typically owns shopping centers, so it is in theory all private property. It’s pretty clear that Walmart wanted us way out of the way, like outer Siberia if possible. The closest truly public property, we were politely informed, was a median strip on Nokes Boulevard, which led into the parking lot. And so we shuffled out there with our protest signs, dodging aggressive traffic to do so. We got the occasional thumbs up and toot of a horn in support, but mostly Walmart had gotten us out of the way, which is probably the strategy it emulated at many other stores. Had we had more protesters, perhaps we would have been harder to dislodge. After about an hour we ended our protest and moved on. Nonetheless we were in reasonably high spirits. Without professional organization, we didn’t know what to expect or what was legal, but Walmart’s response felt very scripted. The store manager was never angry with us, but after the event one of our crew took a few of our signs into the store, and tried to give them to the store manager. She was intercepted by an assistant manager, and told she was unwelcome in the store, and ordered to leave. Making change at Walmart is hard, not so much for us outside protesters, but certainly for Walmart employees who join the Our Walmart movement. They frequently suffer illegal firings or reduced hours. They are much braver than we were. We were just testing the protest waters, but I think I know where I’ll be next Black Friday. And hopefully we’ll be better-organized next time, and our organizer won’t use the weasely excuse of insomnia for not showing up. As a practical matter, real change is happening in two fronts. First, many states and communities have realized that since retailers won’t raise wages and the federal government won’t, they must. So cities like Seatac in Washington State have raised their minimum wage to $15 an hour. In Northern Virginia, $15 is a living wage, but just barely. Those Walmart workers earning $8.80 an hour or so at their Sterling store are probably working a couple of other part time jobs just to get by. They may very well be getting some government assistance, which means your taxes are subsidizing Walmart and other retailers scandalously low wages. More recently, the city of San Francisco passed a retail workers bill of rights. It requires employers to make up work schedules for their part time employees two weeks in advance, helping to give them some predictability to their schedules. This addresses the sad reality that part time work these days does not supplement other wages, but is what many workers try to live on. Do not assume that minimum wage workers are mostly students living at home and thus it’s okay to pay the $7.25 an hour. The average age of a minimum wage worker is 35. These people are hustling simply to survive in poverty. They deserve a living wage and better working conditions and hopefully just one job so they get some downtime. It’s quite clear though that Walmart will continue to frustrate and obfuscate attempts at justice for their employees until the price becomes unbearable, i.e. it seriously affects their profits and sales. I will do my part to make it unbearable.